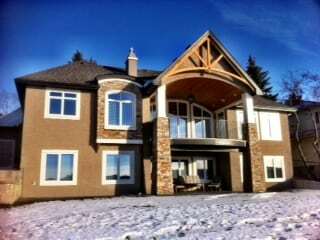 Aspen Woods is a SW Calgary luxury community host to a wide variety of both new and resale homes. Established in 2001, it is a developing neighbourhood with tons of desirable real estate made true by three things; exceptional luxury homes by quality builders, beautiful community design and outstanding location. Luxury homes are regular here where acreages, executive estates and some of the most expensive real estate in Calgary are found! Beautiful architectural controls, elegant landscaping, backyard views of the Rocky Mountains, interconnected ravines and pathways and more are part of what makes real estate in Aspen Woods so popular! Here are 3 Reasons to Buy a Home in Aspen Woods Calgary. Aspen Woods is a strong family-oriented Calgary community great for raising the kids in and also has all the amenities and services nearby for a comfortable living experience. Its developers and home builders, of whom I will list and detail in future articles, have done an amazing job of making Aspen Woods the luxury community it is. Today, Aspen Woods is continually expanding in size, with a number of subdivisions including Aspen Acres and Aspen Summit under way, providing more living opportunities in the highly desirable neighbourhood. Having the ability to reach downtown Calgary via Bow Trail SW or 17th Ave SW in less than 20 minutes while also being able to immediately leave the city boundaries and escape west to the Rocky Mountains are two features of Aspen Woods that has made it hard to look past for Calgary home buyers. Main shopping areas such as the West Hills Town Centre and Aspen Landing are in Aspen Woods or close to and commuting to South Centre or Chinook takes less than 15 minutes. Public transportation is found all around the area and includes an express Aspen Woods downtown shuttle during the weekdays. One of Calgary’s best recreational centres Westside, is across an adjacent SE corner intersection of 17th Ave SW and 69th St SW. Equipped with only the newest equipment, it’s a great place to work out and enjoy leisure. Available are an aquatic park, fitness centre, running track, gymnasiums, rock climbing wall, hockey rink, family oriented programs fun for everyone and more! Maybe outdoor activities are preferred. Several recreational parks are close by Aspen Woods including Edworthy Park, Glendale Park and Weaselhead Natural Area while golf courses such as Pinebrook Golf & Country Club, Elbow Springs Golf Club and the Glencoe Golf & Country Club are nearby as well. Don’t forget Bragg Creek, Kananaskis Country and the mountains! It could be that Aspen Woods has the highest amount of school options for students out of all of Calgary. Options for luxury home owners like this should be standard everywhere. Public school designation for elementary students is to Olympic Heights or Wildwood. When Olympic Heights is at capacity, students are to attend Wildwood as an alternative. Junior high students are to attend Vincent Massey, while Ernest Manning is the designated high school. Many private schools are in the area including Rundle Academy, Webber Academy and Calgary Academy. Catholic schools such as St. Joan of Arc, St. Gregory and John Costello are also close! Tons of options for your child’s education are available when living in Aspen Woods. Want to know more? Be sure to check out Aspen Woods Calgary – A Popular West End Community today! Questions about Aspen Woods Calgary? Call my direct line at 403-370-4180 or message me at the bottom of the page. I will get back to you within the hour if we don’t connect immediately!